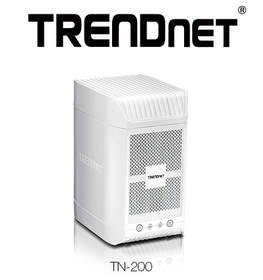 TORRANCE, CA--(Marketwired - Jun 5, 2013) - TRENDnet, a best-in-class wired and wireless networking hardware brand, today is excited to announce the 2-Bay NAS Media Server Enclosure, model TN-200 -- a powerful entertainment and storage hub of your digital network. DLNA certified Smart TVs, media players, and game consoles can automatically find and play multiple HD videos and music from the TN-200 simultaneously. An iTunes® server provides the ability to share a massive iTunes library across your network. The TN-200 accepts two 3.5" SATA hard drives, sold separately, for a total storage capacity of up to 8 Terabytes. Additional storage can be added using a convenient USB share port. A Gigabit Ethernet port maintains a high speed connection to the network. The intuitive setup wizards get the TN-200 up and running quickly. "The TN-200 has an intuitive interface which novice users can easily navigate," said Sonny Su, technology director for TRENDnet. "It's packed full of features to support efficient content storage and sharing."